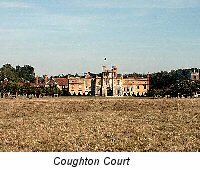 This delightful circular walk starts from The Throckmorton near Coughton Court a well know National Trust property. The walk will give you a flavour of The Millennium Way taking you across mostly flat countryside with no stiles. Approximately 6¾ miles in length, and clearly marked with the distinctive black Millennium Way circular waymarkers. Find out more about the walk by clicking on the information icon. Turn right out of "The Throckmorton" pub car park and walk down the main road for approx ¼ mile, passing a footpath on left and entrance to Coughton Court. Continue further down main road enjoying fine views of Coughton Court on your left, to reach the crossroads just a few yards past the pedestrian crossing. Turn left down Coughton Fields Lane to pass the coach entrance to Coughton Court and Throckmorton Catholic Church on left. 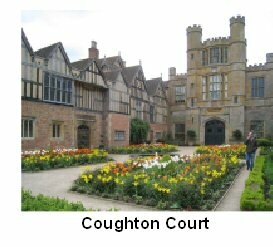 Coughton Court has been the home of the Throckmorton family since 1409. It holds a unique place in English history with its close connections to the Gunpowder Plot of 1605. Continue along the lane to cross the ford via a footbridge. Once across the footbridge cross over the lane and take the wide track opposite, (there is a sign " farm access no parking" on the left). You are now on The Arden Way. Continue ahead on this wide track for just over a mile. The track rises gently towards an old barn on your left. Ignore track to barn but stay ahead on the main track with hedge right to continue gently uphill. Keep ahead along track until you reach the road. Turn right at road and after 40 paces turn left down the lane signposted Shelfield Green. Continue along lane for just over ¼ mile and at sharp right hand bend take the footpath left through metal gate signed bridleway and Heart of England Way. The track rises gently to pass the southern tip of Alne Wood on your left. Near the top of the track ignore footpath left and keep ahead to pass in front of a house named Mutton Barn. Go through gated gap immediately ahead keeping close to hedge right, pass under power lines. Bear slightly right through gated gap to enter woodland path, then follow the Heart of England Way to continue along woodland track. Emerging from the woodland stay ahead on path with woodland on left. Soon you will reach a solitary way post. Go 20 paces past the post then take metal kissing gate left signed Arden Way and Heart of England Way. Entering the large field go diagonally half left towards top left hand corner near dwellings and exit via metal kissing gate to lane. Here we leave the Heart of England Way and go left down the lane. Continue past a small thatched cottage right to eventually walk downhill and after 200yds take hidden footpath right up steps and through gap then turn left to walk with hedge left parallel with road to reach corner of field. (There may be an electric fence here). Ignore gate to road left in corner of field, stay in same field, turn right and go with hedge left to find and take waymarked path left through metal kissing gate and go ahead towards wood. Go through metal kissing gate ahead and over small footbridge maintaining line ahead on central path towards edge of wood to find track. Follow track round to the right keeping wood right and continue along track to reach a gap where gate has been removed. Go through the gap then diagonally half left across field keeping to the edge of the young plantation. As you get closer to the hedge stay along with hedge left to take hidden footbridge and metal gate in left hand corner of field. Continue ahead with wood left and on reaching road cross over taking footpath directly ahead to cross small stone footbridge over stream then left to continue under power lines keeping hedge left. Continue to far left corner to find metal gate. Here we join the MILLENNIUM WAY and you will be guided from here by the distinctive black MILLENNIUM WAY markers. Go left through gate following the Millennium Way waymarker, keep hedge left continuing around edge of field then under power lines to exit by wooden gate. Go ahead into garden of house and stay ahead with hedge left and pond right to exit garden by gate just to the left of main entrance gate. Emerge from this gate at a junction of several tracks. With your back to the gate, go ahead veering slightly right to go up the steepest of the grassy tracks keeping tall hedge with oak trees on your right and young plantation left. Continue up with hedge right, ignoring two wide gaps right, to narrow corner gap at top of field. Take gap and go forward gently uphill for 40 paces where you will see twin electricity poles in mid field ahead. Continue to summit passing just to the right of these twin poles and stay forward to take gate in corner near to two large trees. Go ahead with wire fence on right to walk gently downhill and take metal gate ahead. Continue downhill with hedge right to take another metal gate then follow down between wooden fence and hedge passing to rear of cottages to reach corner metal gate. Take gate then go forward a few yards to take next metal kissing gate and turn right down road. Follow road to take first surfaced lane on left. Pass house on right to reach the former Church of St. Leonard's Spernall. Pass church on your right and immediately after church gate go through wooden kissing gate. Go ahead with fence right eventually reaching metal gate giving access to metal footbridge over River Arrow. Continue ahead close to riverbank left, into the narrowing of field to take kissing gate ahead. Go half right across the next field to the corner where there are a number of hedgerow oaks to find gate. Take gate, turn immediately right with hedge right and a fence on your left. Go to field corner, stay in field but turn left in front of gate and go with hedge right walking towards Coughton Court ahead. On reaching next corner take kissing gate and turn right into next field. along a short distance with metal rail fence right to take another kissing gate then go half left across field towards the cottages on far side to exit by kissing gate to emerge on to main road where we leave the Millennium Way. 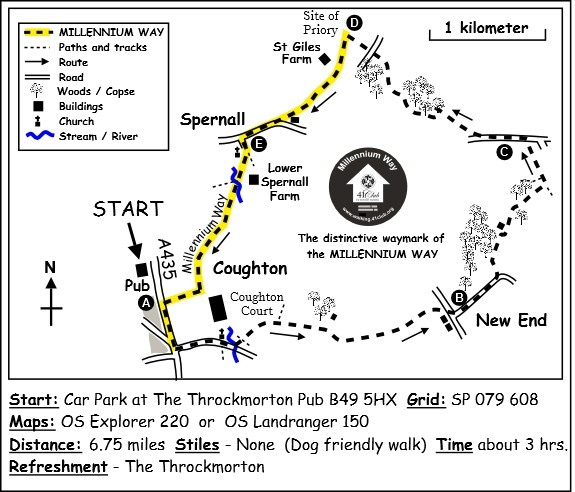 Turn right at road to bring you back to your start point at "The Throckmorton" for some welcome refreshment. A largely Elizabethan house and the home since 1409 of the Throckmortons, a catholic recusant family who refused to give up their faith and suffered the consequences (heavy fines and even imprisonment). Sir Francis Throckmorton (1554 – 1584) was a conspirator against Queen Elizabeth I of England in the Throckmorton Plot. He was convicted of high treason and executed in 1584. Later generations, together with the Catesby family, were heavily involved in the Gunpowder Plot, the plan to blow up Parliament and kill the King in 1605. Although the house is now in the hands of the National Trust, the gardens, which were designed and created by the present Throckmorton generation, are still maintained by them, and the family still live in the house. 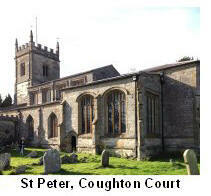 Dedicated to St. Peter, built by Sir Robert Thockmorton between 1486 and 1518, the church is conveniently (for the family) located next to Coughton Court. The church is built on the plan of an earlier church, which was the endowment of the 12th C Studley Priory. The village consists only of the church and rectory and a few scattered farms and cottages, because at some time between 1195 and 1361 the parish was largely depopulated by pestilence. Recently the Purity Brewing Company was established in Upper Spernall Farm and the brewery can be visited and ales sampled. This delightful church was closed and declared redundant in 1972 and in 1976 the diocese applied for demolition. The Friends of Friendless Churches and the Ancient Monuments Society took an interest in conserving it. 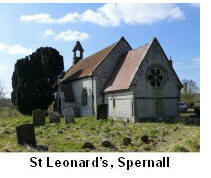 In 1980 it was bought by the Ancient Monuments Society. It is the only church to have been owned by this society. For almost thirty years the church has been used by the highly talented artist, Nicholas Jones as his studio. He moved in in 1983 and has been there ever since producing a very varied corpus of art.